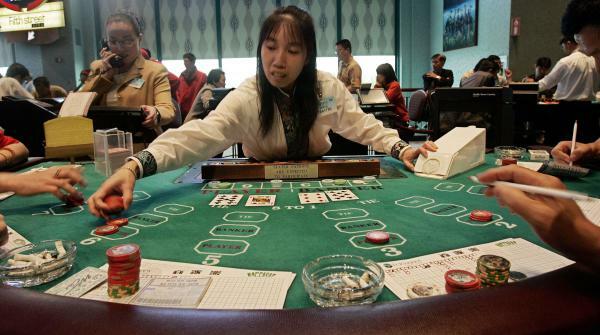 Dealer Cai Qilin, center, works on Mini Baccarat at an Asian gambling section in Foxwoods Resort Casino in Mashantucket, Conn., in 2006. Foxwoods estimated at the time that at least one-third of its 40,000 customers per day were Asian. Quyen Truong still gets a cozy feeling when she sees a hand of cards. It reminds her of family and traditions as a refugee from Vietnam who arrived in the U.S. in late 1990. Aunts, uncles and cousins in Connecticut — among the Southeast Asian refugees who resettled here in waves after the Vietnam War — would get together on weekends with rolls of quarters, nickels, pennies and dimes. Card games lasted late into the night over several courses of traditional Vietnamese food. Children rooted for their parents. The role of fortune and luck is big in some Asian cultures. Cards and dice games get woven into memories of baby showers, birthdays, weddings and funerals. As refugees in the U.S., Truong and others said, some of the most thrilling outings as a family are day trips to glitzy casinos that cater to Asian patrons with Asian cuisine, entertainment, translated signs and native Asian-speaking workers. The downside of gambling is what Truong’s father warned her about. 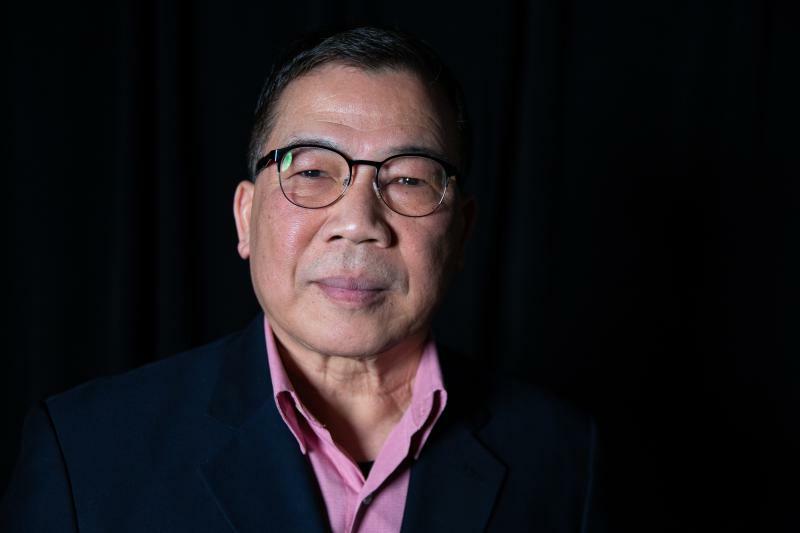 The former South Vietnamese soldier — jailed for seven years in a re-education camp after his American allies left Vietnam — cautioned his daughter against playing cards “too much” and “getting into trouble with it,” Truong recalled. Southeast Asian refugees are among the groups that are especially vulnerable to falling into gambling addiction, experts say. One groundbreaking study more than a decade ago in Connecticut examined a sample group of refugees from Vietnam, Cambodia and Laos — and reported their rate of gambling addiction was almost 30 times the national average. Yet Southeast Asian refugees are often overlooked in the public policy debate over the expansion of legalized gambling, as states across the nation push for new sources of revenue to fill holes in government budgets. Advocates in the Asian community and gambling experts say this feeling of invisibility helps fuel the “hidden” addiction. A tradition passed through generations, they say, can spiral out of control for some refugees who then find it difficult to get help. Howard Phengsomphone, 70, a Laotian elder in the Hartford area, has been trying to coax people in his community to talk about problem gambling. “It’s not easy,” he said. Although gambling is socially accepted in his culture, and is perceived by some refugees as a way to make fast money, gambling addiction is considered taboo — part of a bigger cultural stigma in Asian communities over mental health and addiction issues. National data show that Asians are least likely among ethnic groups in the U.S. to use mental health services. 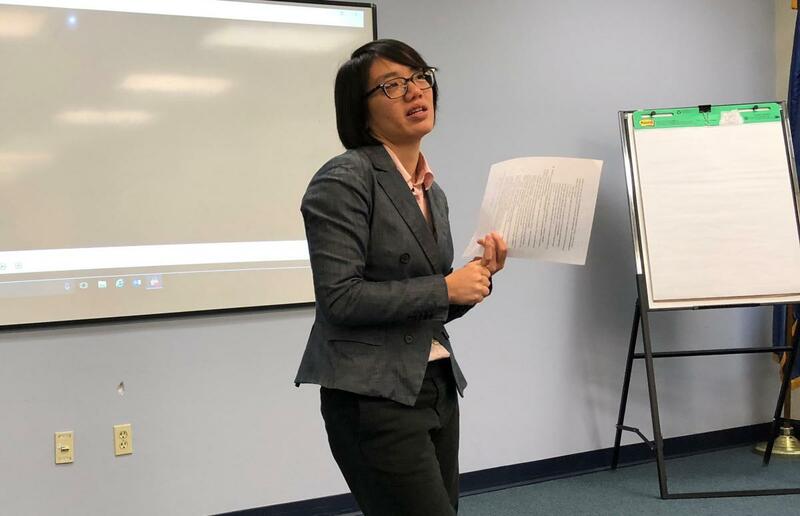 Among Southeast Asians in Connecticut, community health advocates say the stigma becomes another hurdle to accessing the American health care system, on top of language barriers and skepticism of traditional, Western methods of treatment. From a clinical perspective, experts say that the high level of trauma for Southeast Asian refugees is one of the reasons why the odds may be stacked against them. The high of gambling becomes “a way of seeking comfort,” as Fong put it. A 2003 study that examined gambling habits of 96 Vietnamese, Laotian and Cambodian refugees in Connecticut found that nearly 60 percent met the criteria for gambling addiction — compared to a national average of about 2 percent in the U.S. Led by UConn Health Center, researchers reported that 42 percent of the refugees had wagered at least $500 in the past two months, and that their choice of games ranged from the lottery and cards to slot machines and scratch tickets. The study noted that many of those interviewed at Southeast Asian community centers said they had been physically tortured in their home countries. Add in easy access to casinos that tap into Asian culture and concepts of luck, and “suddenly you have what we call a cauldron of risk factors,” said Fong of UCLA. “You can imagine the experience of a refugee coming all the way from Southeast Asia and landing in a place like Connecticut that’s really far away, it’s cold ... and all their peers are gambling,” Fong said in an interview. “They’re struggling with acculturation. They’re struggling with language. Poverty-stricken. And suddenly you walk into Foxwoods or the Mohegan Sun,” Connecticut’s two tribal casinos that are among the biggest casinos in the U.S. The Mohegan Tribe of Connecticut owns Mohegan Sun. A spokesman for the casino did not respond to requests for comment on the extent of its Asian clientele. Both tribal casinos are partners of the Connecticut Council on Problem Gambling and give funding for awareness and prevention programs. “This issue can affect anyone, regardless of gender, age, social, ethnic or economic group, and we remain committed to providing resources for those who may need help,” a Foxwoods spokesman said. But especially within Asian communities, advocates and health care workers say a gambling addict may go unnoticed in society until the stress of heavy debts manifests into broken families, bankruptcy and physical pain. 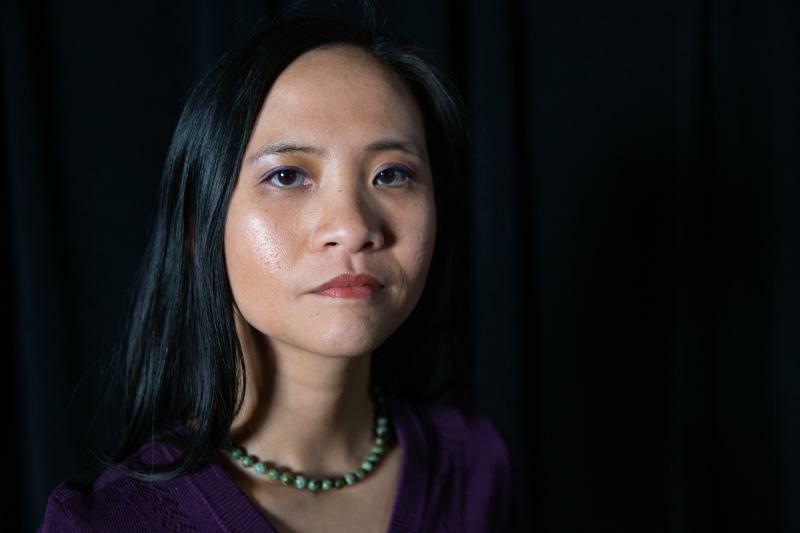 That’s because problems are kept “hush-hush — within the family, within the community,” said Sabrina Chau, a domestic-violence outreach specialist in Hartford who works with Asian families. Asians represent five percent of the Connecticut population, but only about three percent of the callers who have sought help from the state’s problem gambling hotline since 2015, according to data from the Connecticut Department of Mental Health & Addiction Services. At Asian Family Services in Hartford — a clinic that counsels Asians struggling with issues that include problem gambling — employees said clients rarely come in until there’s a crisis. The lead case manager is Tuyen Long, a survivor of the “Killing Fields” in Cambodia who arrived in the U.S. as a refugee in 1983. Sometimes, clients show up because child-protection services got involved and made it mandatory, Long said, or doctors referred them to the clinic after they landed in the hospital. Gambling experts say that shame can lead to a snowball effect with potentially devastating consequences. “So this may lead to people gambling for longer periods of time and experiencing greater problems before they share or disclose some of their struggles and seek help,” said Dr. Marc Potenza, a Yale psychiatry professor and director of the Yale Center of Excellence in Gambling Research. Mari Merwin, an immigrant from Japan, used to work with Long as a clinician at Asian Family Services. Several years ago, she said, one Vietnamese woman came into the clinic feeling suicidal after her husband gambled away all their money at the casino and skipped town, saddling her with two mortgages she couldn’t afford. The bank foreclosed, and the woman received treatment and case management from the clinic. Eventually, she moved in with her sister. Merwin later joined Asian Ambassadors, a pilot program seen as a potential national model on how to reach Asians — and other minority groups — on the sensitive topic of problem gambling. 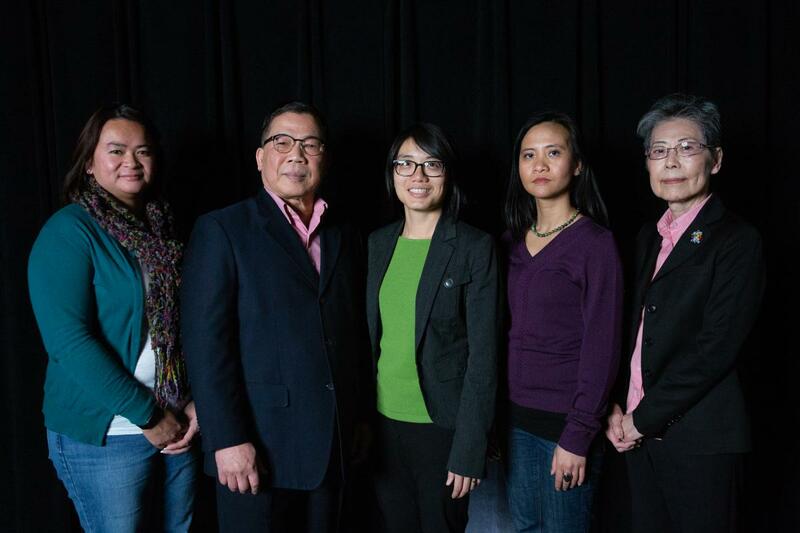 The Asian Pacific American Problem Gambling initiative is a partnership with Problem Gambling Services, a state program largely funded with revenue from the Connecticut Lottery. The ambassadors are Asian immigrants who hold sessions tailored to their communities on the warning signs and how to get help. They include Merwin, Truong, Thammavong and Phengsomphone, the Laotian elder. He speaks Lao at the community sessions that are sometimes held at a Buddhist temple, and said he is careful not to offend anyone when broaching the subject of problem gambling. The ambassadors also give presentations to employees of the Connecticut court system and others who may come in contact with Asian problem gamblers — the initiative isn’t limited to the Southeast Asian community. But in talks within the community, Truong and Thammavong said they prefer using the phrase “financial literacy.” Gradually, they ease into gambling. 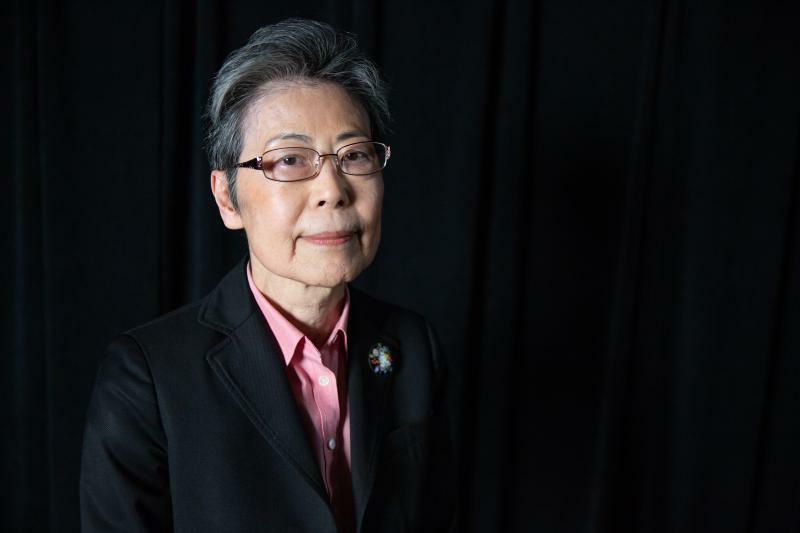 Mui Mui Hin-McCormick, an advocate in the Asian American community in Connecticut, recruited the ambassadors a few years ago. One of the difficulties they face, she said, is that concepts of mental health and addiction don’t have a direct translation in many Asian languages. And because casino gambling is legal here, some immigrants and refugees wonder: If gambling is legal, why is it a problem? Those cultural nuances are why it was important to choose gatekeepers in the Asian community who can try to break down barriers that have prevented problem gamblers from seeking help, said Miriam Delphin-Rittmon, commissioner of the Connecticut Department of Mental Health & Addiction Services. “The ambassadors end up being individuals who are trusted,” Delphin-Rittmon said. Connecticut is one of the states that is considering legalizing sports betting after last year’s Supreme Court ruling. The ambassadors said they do not discourage gambling. Their point, they said, is giving people enough information to make decisions for themselves, and giving them a chance to hear it from folks who speak and look like them. "Fixed Odds: Problem Gambling in America" is a reporting project from Sharing America, a public radio collaborative that covers the intersection of race, identity and culture. The "Fixed Odds" series explores the impact of problem gambling on communities of color. Sharing America is funded by the Corporation for Public Broadcasting and includes reporters at Connecticut Public Radio in Hartford, St. Louis Public Radio, KCUR in Kansas City, Mo., and OPB in Portland, Ore. 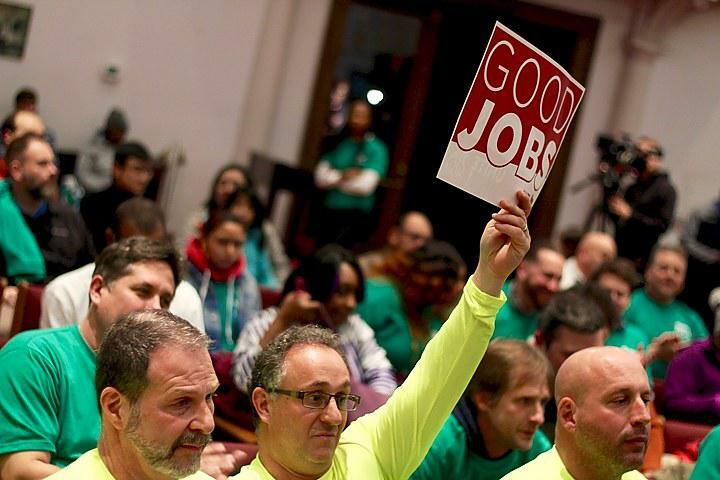 Copyright 2019 Connecticut Public Radio. To see more, visit Connecticut Public Radio. As MGM opens in Springfield, Massachusetts, regulators and casino operators are required to make sure problem gamblers have access to help. There’s a new program called GameSense they hope will fulfill that promise. Massachusetts is offering a program called GameSense to help prevent compulsive gambling. But where can people go when that program doesn't work?